Katherine Hoover (December 2, 1937 – September 21, 2018) was born in West Virginia and resided in New York during her active career as composer, conductor, and flutist. She was the recipient of a National Endowment Composer’s Fellowship and many other awards, including an Academy of Arts and Letters Academy Award in Composition. Four of her pieces won the National Flute Association’s Newly Published Music Competition. Her works are published by Theodore Presser, Carl Fischer, and Papagena Press. Recordings of her music have been issued on Koch, Delos, Parnassus, Gasparo, Summit, Centaur, Cantilena, Bayer, Boston and Leonarda. 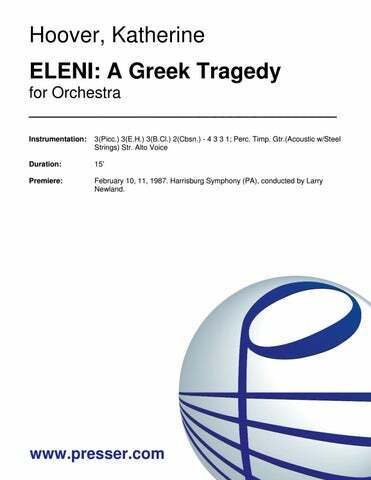 Ms. Hoover’s tone poem Eleni: A Greek Tragedy, has been performed by many orchestras, including the Harrisburg and Fort Worth Symphonies. Stitch-te Naku, for Cello and Orchestra, written for Sharon Robinson, was presented by the Long Beach (CA) and Santa Monica Orchestras, the Women’s Philharmonic, and Orchestra Sonoma. Her Clarinet Concerto, written for jazz virtuoso Eddie Daniels, was premiered with the Santa Fe Symphony. The Colorado and Montclaire Quartets, Dorian, Sylvan and Richards Quintets, and the Eroica Trio have featured her work. The New Jersey Chamber Music Society premiered her Quintet (Da Pacem) for piano and strings at Alice Tully Hall in Lincoln Center. Julius Baker, Eugenia Zukerman, Jeffrey Khaner, Mimi Stillman, Carol Wincenc, and Metropolitan Opera bass John Cheek have also presented her pieces. The commissioning, rehearsing, and premiere of her Dances and Variations at Kennedy Center are the subject of an Emmy-winning documentary, called New Music, by Deborah Novak. “Classical Pulse,” Jan. 1997: critic Leslie Gerber picked Hoover’s Quintet (Da Pacem) as one of the five best recordings of 1996. In November of 2002 Ms. Hoover’s Requiem: A Service of Remembrance for chorus, soloists, speakers, brass, percussion, and organ (featuring poetry by Walt Whitman) was premiered at St. Peter’s Lutheran Church in New York City. Ms. Hoover attended the Eastman School of Music and holds a Masters in Music Theory from the Manhattan School, where she taught for many years. Her main flute study was with Joseph Mariano and William Kincaid; she has given concerto performances at Lincoln Center and performed with ballet and opera companies in New York’s major halls, as well as recording solo and chamber repertoire. Ms. Hoover also attended the Conductors Institute and led performances in Wisconsin, West Virginia, New York, and Pennsylvania. 20:00 Solo Bb Cl. ; 2 2 1 2 A.Sax. – 2 3 3 0; Perc. Str. 22′ 3(dbl. 3Picc.) 3(dbl.E.H.) 3(B.Cl.) 3(Cbsn.) – 4 3 3(B.Tbn.) 1; Timp. 3Perc. Pno.(dbl.Hpsch.) Hp. Str. 19:00 Solo Fl. ; 1(Picc.) 1 2 1 – 2 0 2(B.Tbn.) 0; 2Perc. Hp. Str. 8:00 2(Picc.) 2(E.H.) 2(B.Cl.) 3(Cbsn.) – 2 2 1 0; Timp. 3Perc. Pno. Cel. Hp. Str.